The Russian-Chinese strategic partnership (RCSP), indoctrinated in 1996, is Eurasia’s geopolitical anchor in the 21st century, shaping its evolution and entrance into the Multipolar World. No other political relationship between the two continents’ actors even comes close, with the RCSP’s only formidable rival being the US via its privileged military alliances with NATO, the Gulf Kingdoms, and Japan. In this century’s struggle for the supercontinent, the interplay between the RCSP and the US will come to define global politics. Much ado has been made in the Western media about the RCSP, with some highlighting its significance in challenging the Washington Consensus and others brushing it off as nothing more than Moscow’s increasing dependency on Beijing. The views of the former are often trumpeted to scare Americans and justify their government’s aggression against Russia and China, while the latter serves to feed a disinformation campaign meant to split Russia and China apart. Only rarely is the RCSP mentioned as a cautionary warning for the US to moderate its policies, which is the most responsible way to present this development to the Western voter. The article’s intent is to provocatively argue that the RCSP is already a worldwide reality in the making, the manifestation of Washington’s nightmare, and that it extends beyond Eurasia and even into North Africa and Latin America. It does seek to challenge the Western order, but only to help guide the transition to the Multipolar World, a goal which both countries pledged their solidarity to in 1997. The US’ reluctance in recognizing the tectonic shifts that have occurred in the world since then and its insistence on prolonging the fading unipolar moment are the largest sources of global destabilization today. Despite what the detractors try to achieve by fear mongering and the distracters by divisionary tactics, the RCSP is peaceful, defensive, and more unified than ever. 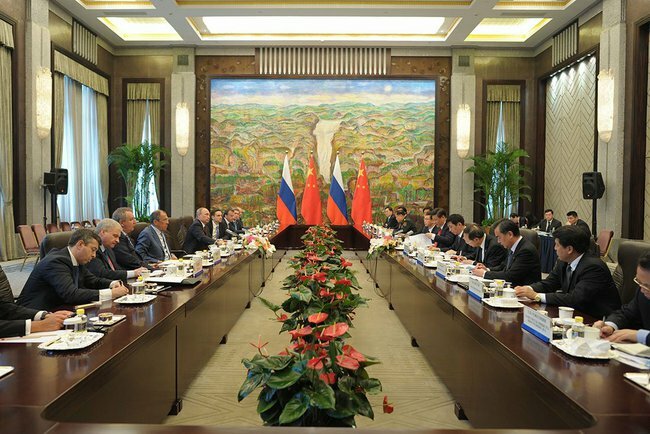 By exploring the confluences of Russian-Chinese policy in key areas of Eurasia and beyond, the article will prove that the RCSP is alive and growing, actively working to steer the world closer to multipolarity. Russia-China talks in Beijing, May 2014. Before moving on into the geopolitical details of the RCSP, one needs to identify its structural underpinnings. These are the roles of Russia and China, the basic fundamentals of their cooperation, and their institutional actions in restructuring the international order. There are certain segmented roles that both partners play through their interaction with one another. Russia acts as military and political balancer across Eurasia, providing an alternative (be it to the US or China) to all Great Powers, emerging states, and interested entities. It will be shown how Russia works in close conjunction with China to make sure that this balancing act satisfies the strategic objectives of both, sometimes playing a ‘good cop, bad cop’ dynamic. China, for its part, is on track to surpass the US as the world’s largest economy in terms of PPP this year, and it is the predominant economic power in the developing world. Its deep and privileged ties with developing agriculture and commodity markets in Africa, Latin America, and the String of Pearls states makes it a valuable economic gateway for Russia, especially in light of recent developments. Thus, what Russia can provide China in terms of military and political balancing in key global regions, China can reciprocate with economic opportunities and trade facilitation there via its already established contacts and elite networks. Of course, the power tandem between Russia and China is far from perfect, as is its strategic application across the world, but this is the general theory of their hand-in-glove approach: Russia is the Balancer and China is the Gateway. The further that one moves from these two, for example, to the Mideast and Latin America, the more they can see the pure multipolar objectives and close coordination between these states; likewise, the closer they get to these two Eurasian cores, the more complex the relationship appears and the more difficult it may be to understand. The Shanghai Cooperation Organization (SCO) is the cradle in which the RCSP was born and raised. Originally founded as the Shanghai Five in 1996, it was reformed as the SCO in 2001 with the inclusion of Uzbekistan. Since then, it has established observer cooperation with Mongolia, India, Pakistan, Afghanistan, and Iran, as well as dialogue partnerships with Sri Lanka, Turkey, and Belarus. These countries directly fall into the immediate sphere of the RCSP, where either Russia or China can exert some degree or another of important nfluence to varying degrees. Also, the SCO sets out the foundations of the RCSP, listing the fight against “terrorism, separatism, and extremism in all their manifestations” (thus including Color Revolutions) as their foremost foe. It just so happens that the US engages in all of these activities in its Eurasian-wide campaign of chaos and control, thereby placing it at existential odds with Russia and China, as well as the other official members. It should not be forgotten that the SCO regularly holds joint military drills among its members, too. In what is the most visible form of the RCSP, the two countries all but cooperate as one force within the BRICS format. In May, Putin stated in regards to China that “We have common priorities both on the global and regional scale…We have agreed to coordinate our foreign policy steps more closely, including within the UN, BRICS and the APEC… We have no disagreements. On the contrary, we have vast plans that we are fully determined to translate into reality.” This groundbreaking declaration of global intent made the indispensible transition to action during the July BRICS Summit in Brazil, during which the five members founded the New Development Bank to directly confront the West’s institutional economic dominance. Important memorandums on multipolar understanding and the creation of a currency reserve pool rounded out the other important outcomes of the event. One can thus see that BRICS has become the institutional bastion of Russian-Chinese coordination all across the world. Russia and China have their own distinct roles to play within their power tandem, and they are still refining the interplay between them. The SCO, although being a multilateral framework, essentially functions as a bilateral entity for larger Russian-Chinese cooperation, using Central Asia as a practice ground for future applications elsewhere. Continuing with the institutional cooperation between Russia and China, one can most clearly see this in BRICS, most notably in the latest summit. When analyzed as a unified whole, both countries are combining their individual strengths within the proper institutions in order to pursue the shared goal of multipolarity.